It is always exciting to travel out of the country you live in. You learn from every experience, it is fun to be in another country, you explore different places, observe different cultures, there are thousands of reasons to love traveling for the good. However, if something bad happens, the entire trip is ruined. 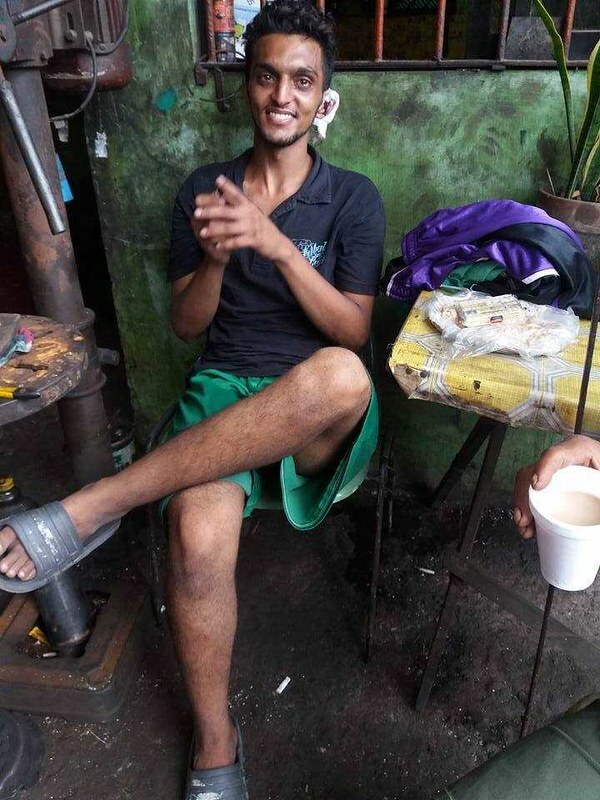 Wessam B AlSahli is another young enthusiastic Saudi who went to the Philippines for the recreational trip. One day he went out of his hotel and something happened to him which he cannot explain. Unfortunately, he has forgotten his name, hotel details, passport, and any other identity proof. 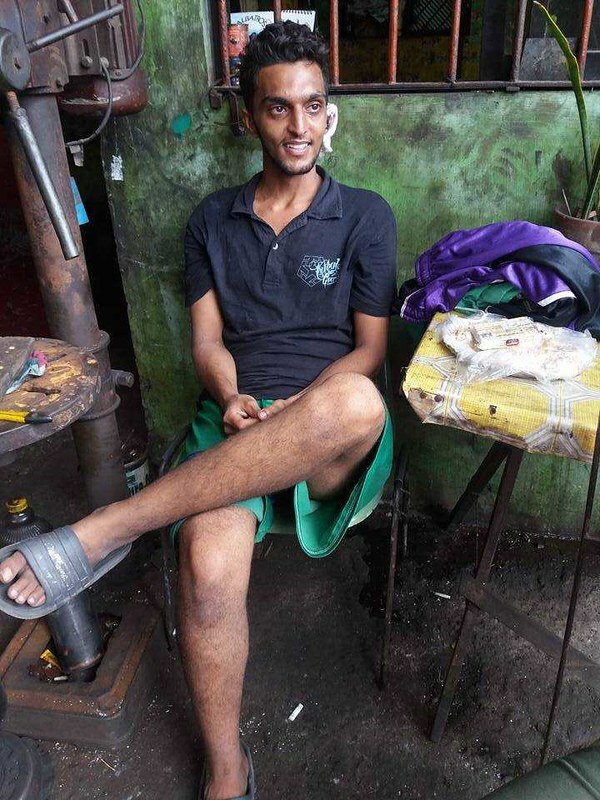 Some citizens took noticed his situation and gave him shelter at their place. 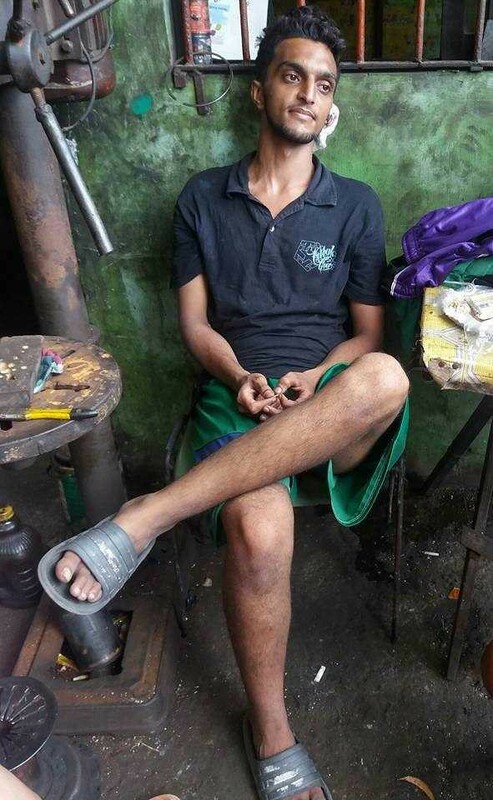 He is now currently living on the streets of Gumaong East, San Jose, Del Monte Bulacan Philippines. Luckily, he is found and taken good care by a good-hearted Filipina, Rev Calilap. Social Media is a great platform; the power of social media is still unmeasurable. A post with two pictures of Wessam B AlSahli went viral on 28th of September and everyone started sharing it considering it their responsibility. Rev Calilap is now asking the Saudi community in the Philippine to help them find the relatives of Wessam, and for him to immediately and finally go back home. There is another way which she has not yet tried and I would encourage her to do this is to contact the Saudi Embassy in Philippine. Saudi Embassies all over the world are very keen to protect their citizens just like any other developed country. They can trace about Wessam B AlSahli merely by scanning his fingerprints. All the details about his whereabouts can be retrieved in a fraction of a minute. The second approach is to contact the Police in the city he is living in. 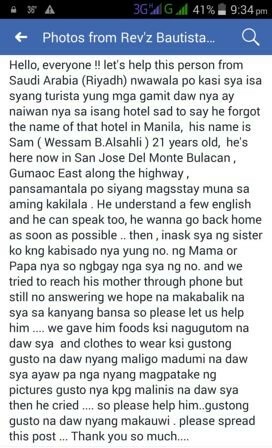 I know Philippines police will not take a normal case of missing person seriously but he is not a normal person. He is a Saudi national. If they take up the case, they can also scan his fingerprints and eye-retina and fetch all the details of his arrival in the Philippines. The third approach is to keep sharing the message here. I hope someone in Saudi Arabia will take a notice of it. If you know the family of Wessam B AlSahli, please contact them. If you are from the family of Wessam B AlSahli, please contact Rev Calilap at the below Facebook profile.